I really like this site and have used it pretty regularly. It has great resources for US History, Economics, and World History. I found this lesson that I plan on using to explain to students where their tax dollars go. In the lesson, students learn why our government levies taxes, where they money actually goes, and how different income brackets pay different taxes. In the first part of the lesson, students analyze a sample paycheck stub and discern between gross and net income, as well as learn what the different deductions from their paycheck are for. We then discuss the benefits and drawbacks of each of these tax deductions and students compute what percentage of income is taken out for taxes for the given pay stub they analyze. In the second part of the lesson students compare the different types of deductions and the impact of saving their money over time in a retirement account like a 401(k), and in the third part of the lesson they discuss where, exactly, they think their tax dollars should go and which programs they should support. I found this resource that I could use to supplement my lesson on unemployment. While we normally go through the different types of unemployment and label them and discuss the causes of each, this gives students a practical look at how they can best prepare themselves to be employed in the future. 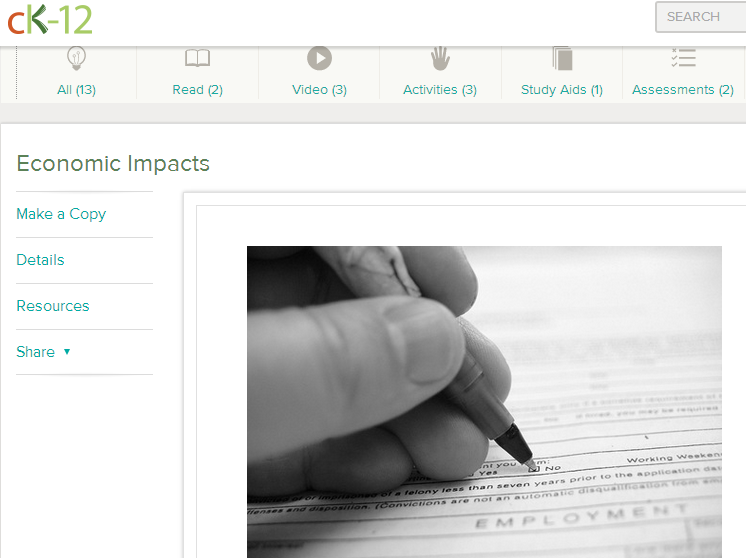 This page has a short explanation of how your level of education affects your employability. It links to an article that gives further explanation and examples of how gender and education are linked to employment rates too. Teachersfirst is becoming really popular! I am glad we added it to 21 Things. Ck12 is good, but limiting.